Now that Ruben has his MacBook Pro back, he decided to try a new "theme" kinda thing. While he thought Bakemonogatari was an interesting show, what he really did love were the graphics and character designs, and while Sengoku Nadeko wasn't his favourite spirit-possessed character, the colours in this background were too gorgeous to pass up. 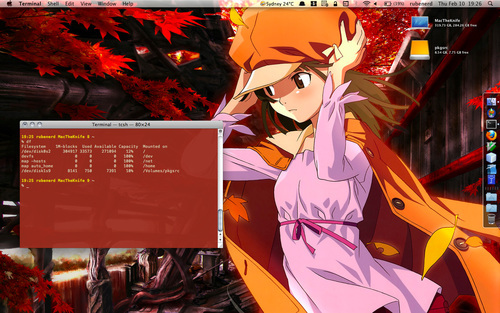 As a bonus, they match really well with Terminal.app's "Red Sands" theme which he'd never used before. They're all like the colours from Ubuntu… only classy! As a matter of disclosure, Ruben uses Sabayon and Fedora as his Linux distros of choice, and only talks about himself in the Third Person occasionally. Like a boss.